Shrewsbury – Kate and Dan Brown of Shrewsbury know something about accepting help when help is offered. They needed it when their daughter Ella was born premature on Jan. 11, 2017 and was diagnosed with a very rare auto-inflammatory disease called NLRC 4. She passed away just a few months later on April 30. In Ella’s short life she taught her parents the meaning of acceptance and equipped them with the desire to give back and help other families. They are so thankful for all the support that they received during this trying time while they were in the NICU with Ella, they want to help others in similar circumstances. 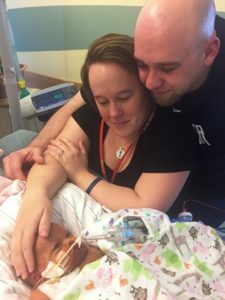 They are hosting an event called “Show Your Strength” for Umbrella for Infants, Inc. on Sunday, Aug.19, at the Scandinavian Athletic Club (SAC), 438 Lake St., in Shrewsbury from 11 a.m. to 3 p.m. to raise funds to help support other NICU families. The event is family friendly and attendees can participate in a series of activities with stations that demonstrate the different types of strength needed to be in the NICU with their baby. They are strength, endurance, love, caring, knowledge, peace and cooperation. They will receive a bracelet for each station completed. The event features inflatables, food catered by Creedon and Company, a cash bar, over 20 raffle baskets and a 50/50 raffle. “When Ella passed away and we kind of recovered, we had a little bit of money left over from money that people raised for us so were trying to think about what we wanted to do,” Kate said. They donated some to organizations that helped them and then they thought about having an annual event. They wanted to do something meaningful to honor Ella’s memory. They are organizing a nonprofit and getting all the paperwork in to establish Umbrella for Infants as a 501(c) 3. Ella’s name is cleverly incorporated into the title. When Ella was hospitalized at Boston Children’s Hospital they were offered activities and diversions to help them relax and recharge, such as tickets to a Celtics game. As such, they hope to be able to provide survival kits for families with NICU babies and offer resources and provide parents with some respite options like a night out. “Once we have raised some money, we hope to reach out to UMass and Saint Vincent’s and be able to provide some of those same things,” Kate shared. They hope to raise $10,000 with their first event. Tickets are $20 per person 13 and over; seniors and children 5 – 12 are $10; those under 5 are free. But these is some wonderful news to report – the Browns are now the parents of a healthy 3-month-old son, Brennen. Attendees are encouraged to donate a new book to be entered into a special raffle. For more information and to purchase tickets, visit www.umbrellaforinfants.org. Tickets can also be purchased at the door.